We have operated an Air Breeze BR0001068 since December 2007. The turbine has performed well without any problems and significantly quieter than previous versions in the Air series of micro wind turbines. 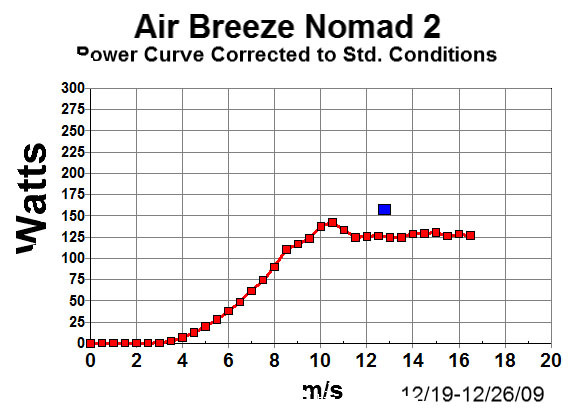 The following summarizes power curve measurements on the Air Breeze. 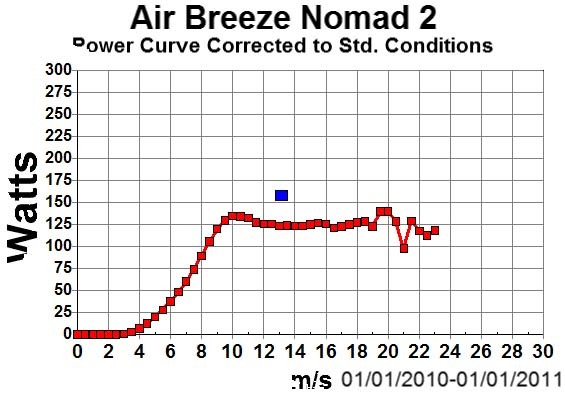 We have now completed a full year of continuous power curve measurements on the Air Breeze. 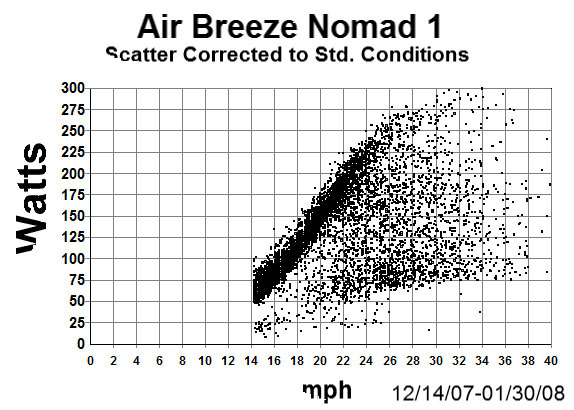 In December 2009 we replaced Second Wind's Nomad 1 data logger with a Nomad 2 data logger as part of a general hardware and software upgrade. For more on this see Wulf Test Field Equipment Description. Second Wind's Nomad 2 data logger is more sophisticated than the earlier Nomad 1 and it took me several weeks to get the bugs out of our installation. We may still not be out of the woods, but it appears we have our first power curve. 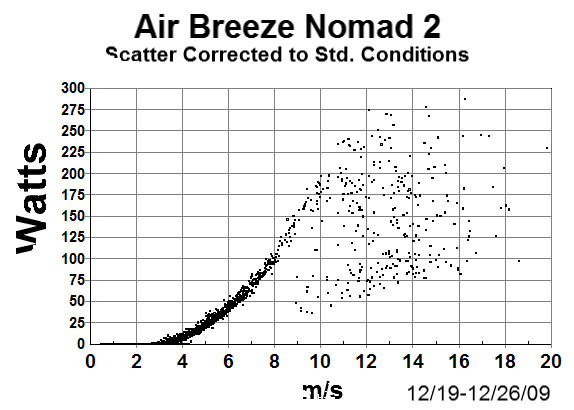 Below is a series of charts resulting from our tests of the Air Breeze. We begin with the most recent data and work backwards to the measurements taken in late 2007. Note that with the Nomad 2 we have switched to metric, so the x-axis scale is in different units from those tests with the Nomad 1. Also note that since the unit was installed Southwest Windpower has rerated the turbine from 200 W to 160 W. The latter appears more accurate based on our measurements in Tehachapi. The first chart is the power curve for the entire year of 2010. During this 365 day period the turbine generated 295 kWh. During this period, the average wind speed at the turbine was about 4.8 m/s. The second chart is the scatter plot. 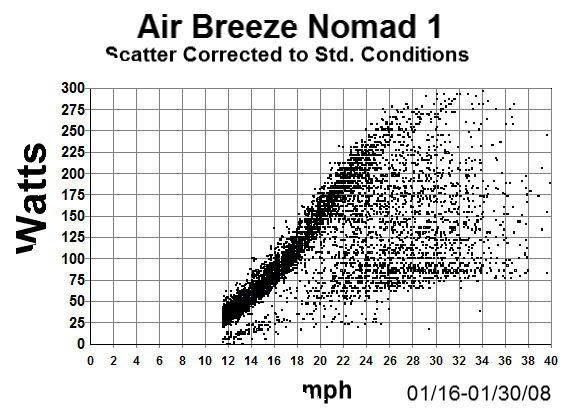 Note that the scatter plot only accounts for a small portion of the data points collected. The Nomad logger samples only 3,000 data points out of the 365 x 24 x 60 (525,000 one-minute samples). 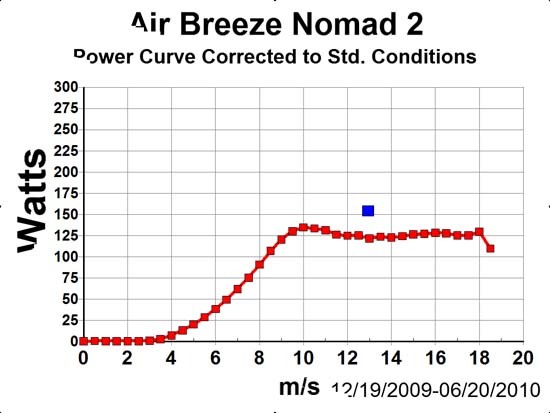 Based on our experience, we can say that the Air Breeze is a reliable micro turbine capable of 125 W in winds from 10 m/s to 18 m/s and capable of generating ~300 kWh per year at a 5 m/s site. The Nomad 2 allows the processing of much bigger files than the Nomad 1. The first two charts below represent data of 1-minute averages from 185 days, or more than six months of data collection. This is probably the most data collected and published on any model in the Air series of turbines. Though the data set contains 1-minute averages for 185 days, the Nomad 2 function of producing a times series includes only 3,000 data points from the entire set. As in all the other scatter plots below, there is a clear trend line. However, the power curve reflects both the high points, the data clustered around the trend line, and the low points. Thus the power curve is lower than the trend line because of the periods in gusty winds when the turbine turns itself off and brakes the rotor. 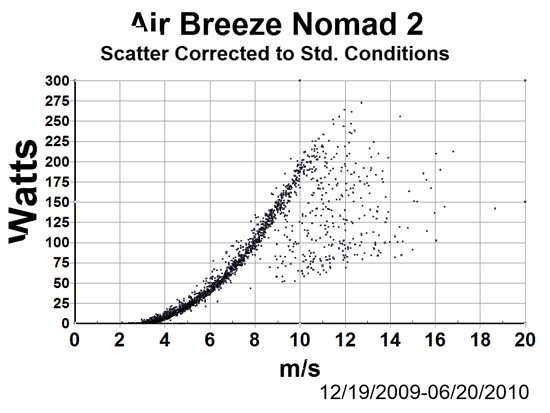 Nevertheless, this model of Air Breeze works far better than any previous version of the Air series of micro wind turbines. The blue square represents the rated power. Again the blue square is the rated power. The rated power was originally 200 W at 28 mph. There is another anomaly. 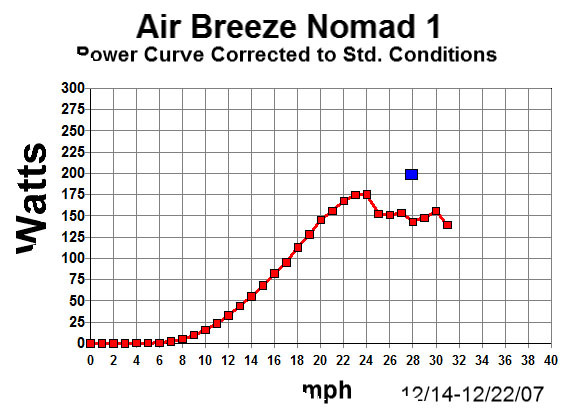 The power curves made earlier show the turbine reaching a peak of 175 W at 24 mph. The current measurements show the turbine reaching about 150 W at 10.5 m/s. There is no simple explanation for this. Measurements in mph with the Nomad 1 used a different data configuration for the Maximum anemometer. 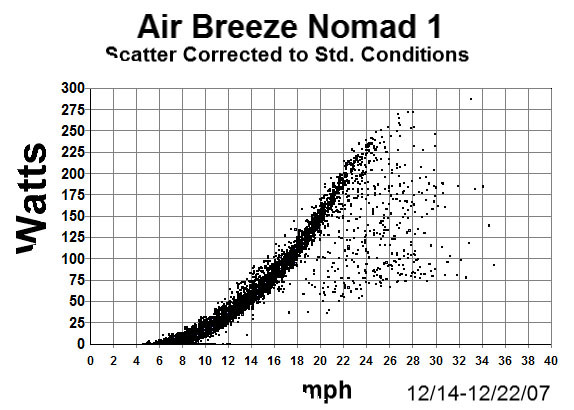 For the Nomad 1 tests, we used NRG's recommended slope and offset. For measurements in m/s with the Nomad 2, we used Second Wind's recommended slope and offset. All other equipment and settings remained the same. The difference shown here illustrates the difficulty of replicating power curve measurements without full knowledge of the equipment used and the specific data configuration used. The Nomad 2 also reports the time series data in a slightly different manner than the Nomad 1. 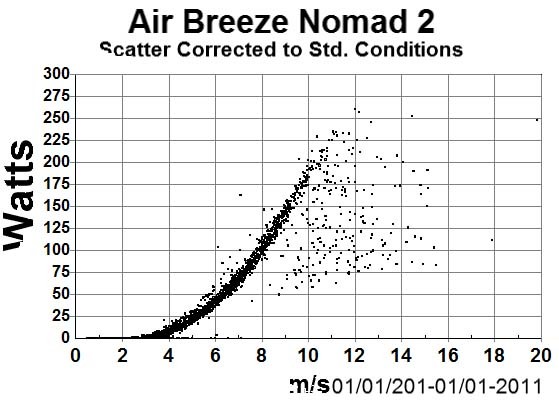 Though both use 1-minute averages, the scatter plot for the Nomad 2 has averaged three 1-minute samples together. The data is there but the averages are reported in the time series. The cut off of data points below 14 mph is an anomaly of my spreadsheet software.